Our content products empower your workforce by keeping them current throughout the day, offering decision support and helping them to generate business ideas and sales leads. Our customers are small businesses, large companies, all levels of government, education and non-profits. Browse the products below to learn more and to request a quote. Corporate Sales is for groups of 5 people or more. Globe Unlimited is available on all platforms including web, tablet, and smartphone. Access starts at 5 customers per group with volume discounts available. 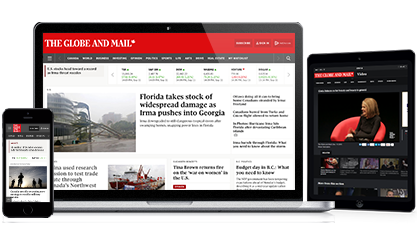 The Globe and Mail print newspaper covers everything you need to know to start your day, in a curated reading experience. The print newspaper includes the recently expanded Report on Business to deliver news and analysis to readers who want to stay current on the ever-changing global economy. Please note bulk sale rates start at 10 copies. Globe Data and Research offers the most comprehensive database of Canadian corporate financial information dated from 1974 to today. This current and historical financial data is ideal for research or sales prospecting. This is a raw customizable text feed that can be integrated into your organization's workflow. Content is updated throughout the day and can be filtered to stories that are relevant to your business needs. Please complete the form and we will get back to you within 48 hours. Corporate Sales is for groups of 5 people or more. Looking for an individual subscription.